The successful German invasion of Crete in May 1941 provoked both the British and Americans to develop airborne forces of their own, and within a few weeks the first US paratroopers were being trained. They were to go on to appear in many theatres of the War and earn their standing as an elite of the US army. Although this is one of the later sets from Airfix, at this stage they were still producing good quality sets with a wide range of poses. Here we find 14 poses which are pretty reasonable, though there is not much action in most of them. The man throwing the grenade looks rather off balance, though he is at least animated. One man is waving his entrenching tool and knife (second row, last figure), presumably in hand-to-hand combat, but the purpose of the unarmed man waving one hand in the air (third row, second figure) is uncertain, although he could well have just been hit by a round. What is missing is any reference to these men being paratroopers - no-one is handling a parachute, and all are in reasonable infantry combat poses. The uniform is the 1942-style, and has been correctly modelled here. 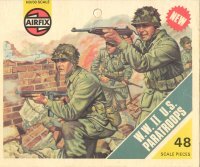 Purists may care to note that by the time of operation Market Garden in September 1944 (the assault on the bridges at Eindhoven and Nijmegen) all US paratroopers wore the similar 1943-style uniform, so these figures are suitable for the early part of the War. All the men wear the Corcoran or Goodrich jump boots, and all have their helmet with the camouflage netting, as they should. Weaponry is not easy to identify, but most seem to have the M1A1 Thompson sub-machine gun or the carbine with either the wooden stock or the folding tubular stock generally issued to airborne troops. This is not a representative sample of the weapons these men used, though they are not incorrect. However the figure on his hands and knees seems to carry a British Sten gun, which is not appropriate. The detail is reasonable on these figures, but quite indistinct and not always easy to make out. In general everything seems to be there, though there is not the sharpness found in top quality sets today. There was some flash, though this tends to vary, but overall this set is passable and should prove quite useful. Oh, and Airfix say that one of the figures is the image of John Wayne, though we have not been able to work out which one it is! However the first figure on the bottom row seems to be the popular choice.